FPCCTC 2nd Season Opening Party 25 April 2008! Dedicated to 1st Season Club Member Volunteers! 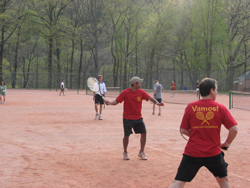 Dedicated to 1st season club member volunteers who helped restore and revitalize four out of six historic clay courts at Frick Park from July to November 2007. Thanks! Your enthusiastic support and hard work made all the difference! Club founders Jose Mieres and Gulshan Sharma presented awards to the 2007 Volunteer Honor Roll click here. 2007 Photo Awards click here were juried by photographer Bob Kubiak (Pittsburgh Filmmakers, Silver Eye Center). 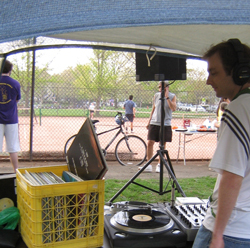 Music was provided by DJ Turnstyles from 5pm to dusk. Event promoted by Pittsburgh 250. 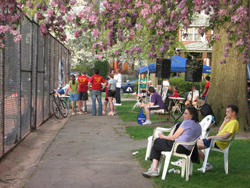 Volunteers from the Frick Park Clay Court Tennis Club for this event: Maureen, Carol, Maria, Eileen, Stefanie, Allen, Dan, Jake, Scott, Craig, Karl, Ed, Gulshan and Jose, and more. Thanks! Volunteers from Citiparks: Jane Famili, Doug Brooks. Special thanks to Duane Ashley, Director of Pittsburgh Parks and Recreation, who shared this special afternoon with the Frick Park clay court enthusiasts on hand for the event. 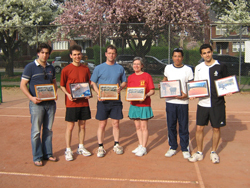 Club members and 2007 Volunteer Honor Roll Award recipients: (from left), Apostolos Christopoulos, Andrew Stein, John Adkins, Maureen Collins, Karl Franklin, and Kambiz Doonboli. Photo by Jose Mieres. 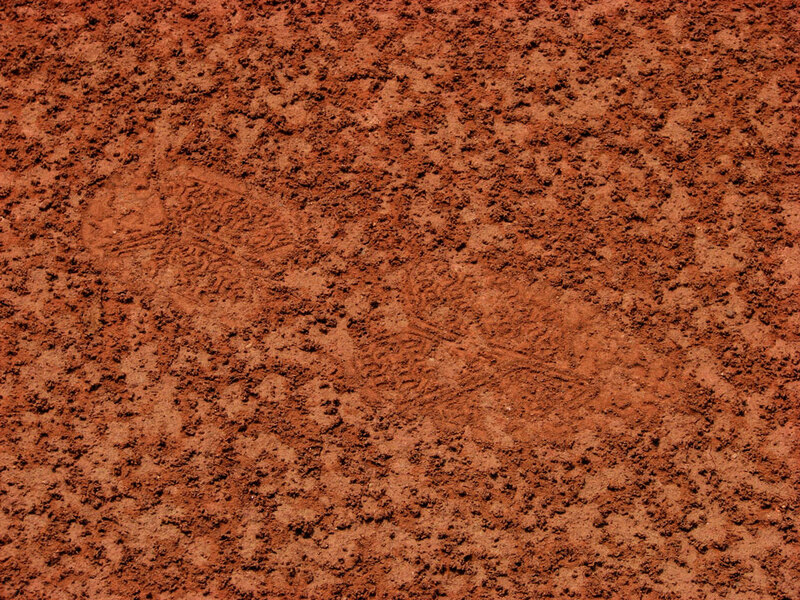 Clay court enthusiasts enjoy the red during the party. Photo by Karl Franklin. Duane Ashley, Director of Pittsburgh Parks and Recreation, and Jose Mieres, Frick club co-founder, share a moment during this very special afternoon for Frick Park clay court enthusiasts. Music by DJ Turnstyles, Craig Simmons. Photo by Jose Mieres. 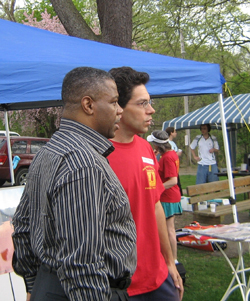 Club member Craig Simmons (center) received the 2007 Most Dedicated Volunteer Award. Thanks Craig! 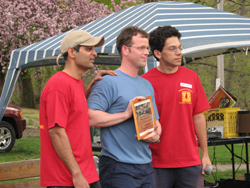 Club member John Adkins (center) receives award for his 2007 season volunteering efforts from Gulshan Sharma (left) and Jose Mieres (right). Photo by Karl Franklin. 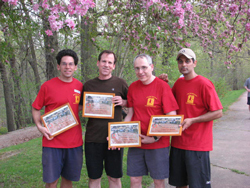 Club members Mark Wallace (2nd left) and Joseph Leibowicz (3rd left) receive awards for their volunteer work during the 2007 season from Jose Mieres (left) and Gulshan Sharma (right). Photo by Karl Franklin. 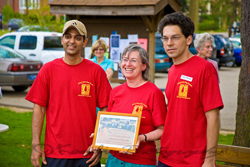 Club member Maureen Collins(center) receives award for her 2007 season volunteering efforts from Gulshan Sharma (left) and Jose Mieres (right). Photo by Kambiz Doonboli. 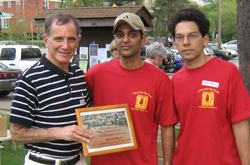 Club member and 2007 Volunteer Award recipient Allen Baum (left) from Regent Square, with Gulshan Sharma and Jose Mieres. Photo by Doug Brooks.